Sterling silver, Red and Orange Oyster Shell, Turquoise, Picture Rock, Black Jade, Opal, White and Yellow Mother Of Pearl. Looking at such beauty makes you appreciate Southwest art! This set is a gorgeous piece of jewelry that is hand crafted out of genuine sterling silver and multicolor inlay. The inlay consists of: real Turquoise, Picture Rock, Black Jade, Red and Orange Oyster Shell, White and Yellow Mother Of Pearl, along with man made Opal. 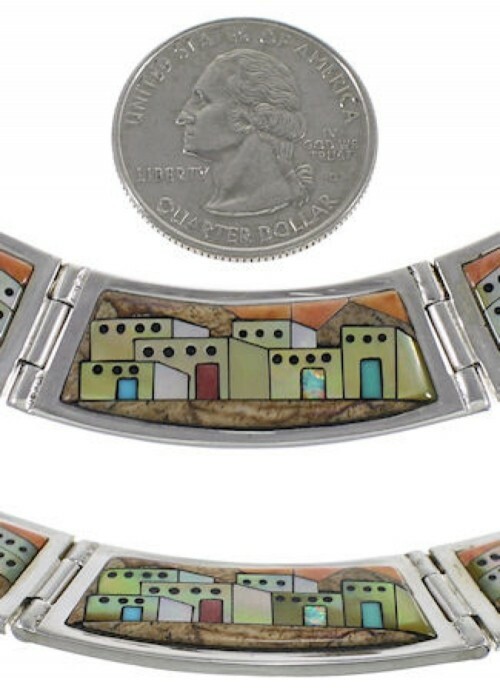 The necklace has a total of THREE links, each link features outstanding, detailed inlay work that forms a magnificent Native American Village Design. A starry sky is shown above a village in this elegant scenery. The necklace is stamped sterling and hallmarked. The earrings perfectly match the necklace for a remarkable finish. The earrings are stamped sterling.